Some Marvel stories are well known by casual readers and longtime fans alike, but Marvel is looking to change the foundations of those stories, including one that features your favorite wall-crawler Spider-Man. The Spider-Man story in question is Spider-Man No More, a classic story that kicked off in Amazing Spider-Man #50 (Volume 1) in 1967. The story features a frustrated Peter Parker, who feels bogged down by all the responsibility that being Spider-Man brings and not getting any of the kudos for it, what with J. Jonah Jameson's constant campaign against him. That frustration leads to Peter quitting his role as Spider-Man, throwing his costume into a garbage can. Peter eventually comes back around, but a new teaser from Marvel suggests you don't really know the reason why he came back aground. 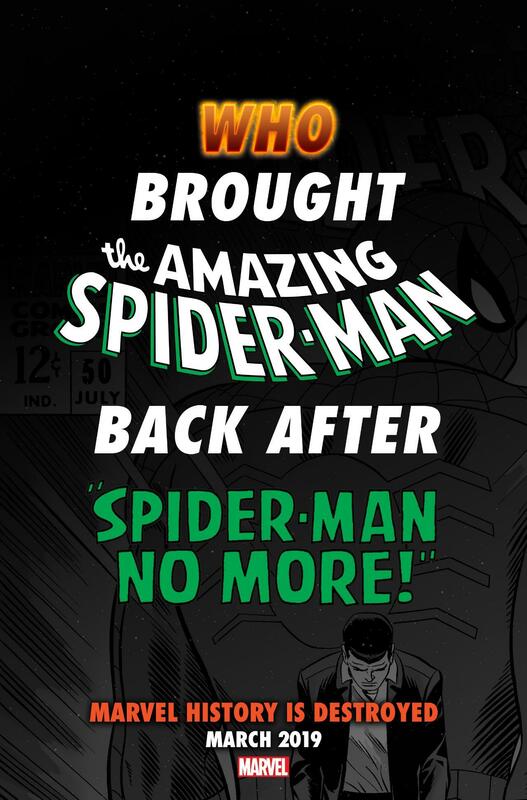 The teaser reads "Who Brought The Amazing Spider-Man Back After Spider-Man No More! Marvel History Is Destroyed March 2019". In the original story, nothing can get Parker to put the suit back on, not even the rising crime rate, but he eventually runs upon someone in need of help, and he cannot turn away. He saves the night watchman, only to realize he reminds him of Uncle Ben, and that brings with it the original with great power comes great responsibility mantra that made him become SSpider-Man in the first place. He realizes he has to put on the suit once again, but this tease indicates maybe there's more to the story. Was the person he saved put there on purpose? Was someone watching Parker? Is there something else at play here? Lots of questions that we want answers to, but we'll have to wait until March to find out. This is the second tease Marvel has released in the same vein. The previous tease involved the Fantastic Four, specifically in regards to who gave them their powers. If the pattern of these two is any indication, we'll likely see even more well-established stories getting reworked, and we can't wait to see who that includes. Are you anticipating this Marvel fans? Should Marvel tamper with these beloved stories? Let us know in the comments!